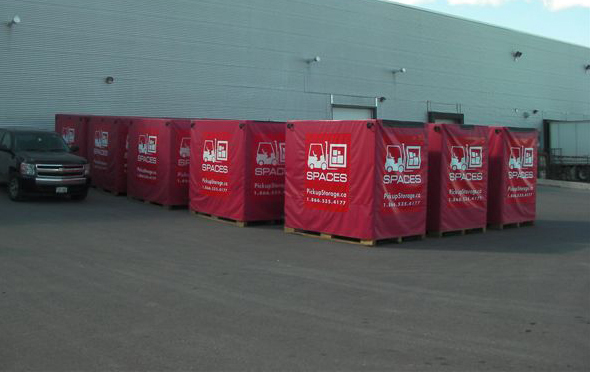 At Spaces we recognize that at one time or another every company is going to have a need for moving and storage. Whether it’s a temporary fix or an unexpected surplus of inventory, an office closing or an office moving, we have the storage and moving solutions for you. Spaces has a cost effective and convenient moving and storage solution that is sure to give you the storage and moving help you deserve. Our portable storage containers provide a way to protect your capital assets and sensitive documents with a storage solution that is dropped right at your door. Ground level loading provides easy access allowing you to move safely at your own pace. When you’re finished loading your container simply give us a call and we will remove the container from your property. If you would like we will move our container to your new specified location or hold the container in our secure facility until you’re ready for your things. Only pay for what you use. At Spaces we’re not looking to pull the wool over your eyes. We tell you our prices and quotes before hand and stick to them so you are not surprised later. We charge a flat fee to drop off your container and a flat fee to return it to you. No extra gas or mileage fees. Other moving companies can get costly especially when they add their hidden fees and moving costs. At Spaces we tell you this information upfront so you never have to worry about unexpected fees. The price you’re quoted in the price you’ll pay! Are you looking to relocate some of your employees? We will work with businesses of all sizes to ensure their employees are taken care of during their transition. Our portable storage containers make it easy for your employees to relocate because we handle the stresses of transporting their goods to their new home.